Bearish mat hold is a complex and rare bearish pattern that forms in a downtrend. It consists of five candlesticks. The first one is a long black candle, which is followed by three small bodied ones. These three candlesticks climb higher and higher but remain below the high of the first long black day. On the fifth day a further long black candle forms, that declines below the low of the first day. It’s a bearish continuation pattern. 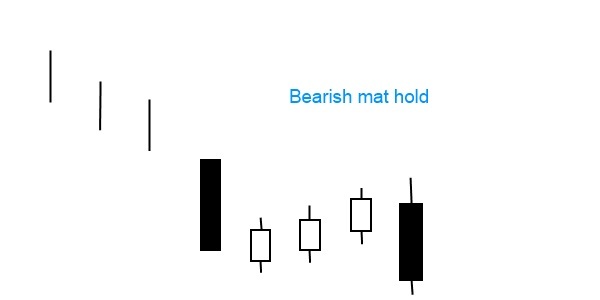 Bearish mat hold pattern is a variation of the falling three methods. In a bearish mat hold, the first white candle opens below the previous day’s low. In a falling three methods pattern, the first white candle opens above the previous day’s low, and all three white candles stay within the first day’s body. It has a bullish counterpart named bullish mat hold.